How Sweet It Is. Thank the Bee’s! American Press Travel News–June 6th, Crossville, TN.-Bees; Oh How Sweet It Is! When a wall in my “Man Cave”, writers cabin at the farm began vibrating and humming, I knew something strange and major was up. I felt that it wasn’t a paranormal happening, so I stepped out back behind the cabin. I stood and watched (from a distance) honey bees flying to and from a small crack in my wood wall. I looked up a professional Apiarist, and found Jeff Dayton from Rainbow Gold Apiary who promised to visit, assess exactly where he needed to open our interior wall to vacuum up the bees along with his 22-year old son, Tyler, after first finding the Queen. They live-caught more than 50,000 bees with a painless vacuum (five pounds) and later transferred the Queen to a new hive box on his property to happily reunite the little fantastic critters with their leader. When the wall was opened, there was no honey left in the wax combs, as it was all eaten by the bees over the winter. They were getting ready to swarm again so in the coolness of early April, and without anyone getting stung, he successfully captured and relocated them to his bee field. My cabin was also not dripping with natures golden delight, and all I had to do was lots of cleaning, and redo the wall-case closed after closing up that outside crack. Bees are fiercely protective of their Queen and their hive. Each of the hundreds of hexagonal wax pupae cells in the honey comb is constantly being attended to by worker bees. In a way, Bees can be compared to the Trojan warriors of history. They take no prisoners and are inherently endowed against all odds, to fight till their death to protect their home and family. To me thinking about what Jeff Dayton told me about the number of bees it takes to make up 5-pounds, that takes 50,000 individuals was incredible. These bees alone (amongst other myriads of insects, and birds too, not to mention the other bee-billions around the world) assist in propagating thousands of fruit trees, vegetables, flowers, bushes and sundry field crops, fruits such as strawberries, blueberries, orchard cherry trees, peach, pear, apple, etc. The world would be a dead place if not for bees. Jeff said that when he was a youngster he and his dad would raid old bee trees. They would “course” the bees flying to and fro, and follow their angles of flight. “We would triangulate where the hives were. 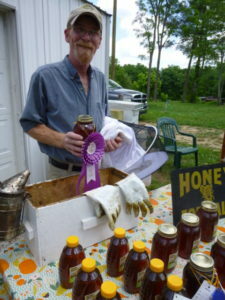 I sure miss my dad, he got me into the Apiary profession, and I am what I am today due to his nurturing and teaching.” Jeff has passed his passion for the little liquid gold -makers in several ways. Besides teaching his son Tyler, he is a fixture at most outdoor special events. This “sweet” guy teaches all who have interest, about the life of the bees and special nature they possess. 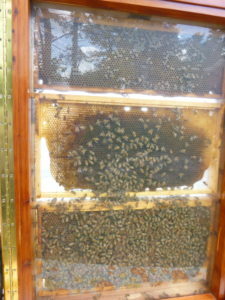 He sets up a window case where people can watch the bees going about their daily lives supplying honey for their hives. Rainbow Gold Apiaries can be reached at (931) 484-9430. He can offer all hive products, offer his bees for pollination and does bee removal from anyone who needs this service at no charge!